George Graham Reviews Tauk's "Brokedown King"
As always, rock music is heading in various directions at the same time. For all the different facets of rock on the scene these days not a lot of of the popular varieties emphasize musicianship. There's alternative rock, slick commercial pop, roots rock, and electronic/synthesizer-based rock. It's the raw emotion, the lyrics, or the dance beat, or just plain volume that drives the music. But the jam band scene has rekindled an interest in the instrumental aspect, some attention to playing well and creating compositions witg substance. Back in the 1970s, there was the art rock scene, and recently, groups like Umphrey's McGee and to some extent the String Cheese Incident have brought back some of the musical sophistication that was the art rock scene's bread and butter. This week, we have the debut by a band who also go for interesting musical compositions that evoke some of the aspects of the art rock scene, while also adding almost a singer-songwriter's approach to lyrics. 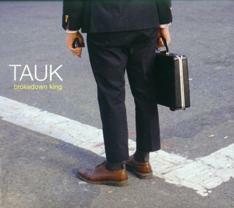 The group is called Tauk, spelled T-A-U-K, and their CD is called Brokedown King. The group's name comes from their hometown, Montauk, Long Island, a place commemorated in the Rolling Stones' Memory Hotel, and Billy Joel's Downeaster Alexa. Tauk the band had an early start. Three of the members, keyboard man Alric "A.C." Carter, bassist Charlie Dolan and guitarist Matt Jalbert met in middle school and began jamming in their school's practice room during lunch break. The rest of the band came together in high school when lead vocalist Alessandro Zanelli and drummer Adam Akpinar joined. After high school graduation, all the members majored in music in college, though at different schools. But they got back together when they could during breaks. They began touring in 2007 and played in some major cities. One can hear the fruits of their academic pursuits in their music, with its compositional sophistication and Zanelli's excellent vocals indicative of some classical training. The group eschews synthesizer sounds and has a kind of classic approach with guitar and organ or vintage electric piano sharing the lead. Not surprisingly, they cite Phish as an influence, along with Wilco and Radiohead. Tauk recorded their CD on two coasts with producer and mix engineer Robert Carranza, who has worked with Jack Johnson. One of the studios they used was Jack Johnson's solar powered studio, along with the famous Ocean Way studio in Los Angeles, as well as one in New York. The result is a tasteful, engaging release showing a lot of good musical ideas with the emphasis on the kind of complications, harmonic twists and unconventional rhythms that are typical for art rock or fusion. Though there are some opportunities for instrumental solos, the music does not really get into extended jams. The compositions are fairly tightly structured. The tunes range from vaguely funky to rocky to sounding like something resembling jazz-rock fusion. Brokedown King the new CD by the Montauk, Long Island-based band Tauk, is an excellent debut recording by quintet of long-time friends who grew up together in school, then remained serious about their music and brought their academic approach to their fairly sophisticated arrangements, to which they added lyrics that are up to the music -- which is not often the case in art rock. The band's musicianship is top level, but the CD does not feature much of any exhibitionism on their instruments. The production is tasteful and understated in a way with little added in terms of studio effects. We'll give the CD a grade of A-minus for sound quality, deducting points for the typical volume compression done to unnecessarily jack up the loudness of the CD. Two weeks ago, we featured the new recording by Marcus Eaton, which was notable for his high-level of musicianship, and sophisticated compositions with creative arrangements. Now comes Tauk's debut, and perhaps we're going to have a little art rock revival going on. I could think of worse developments.